Death Row : Regan Gentry. 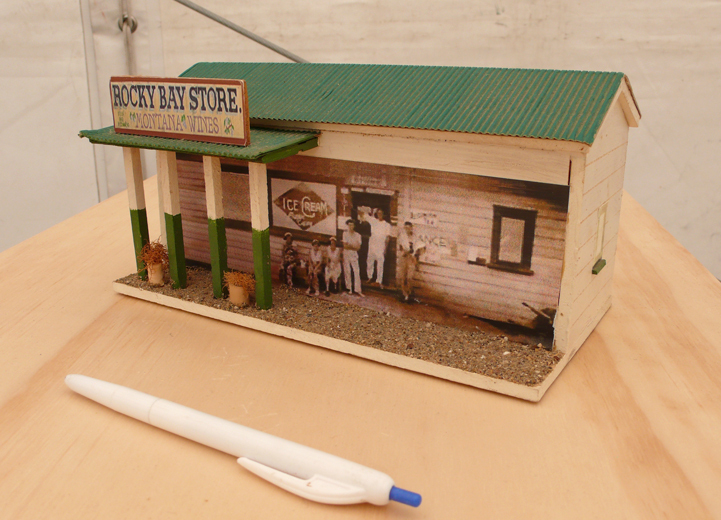 Replica of the Rocky Bay Store frontage. 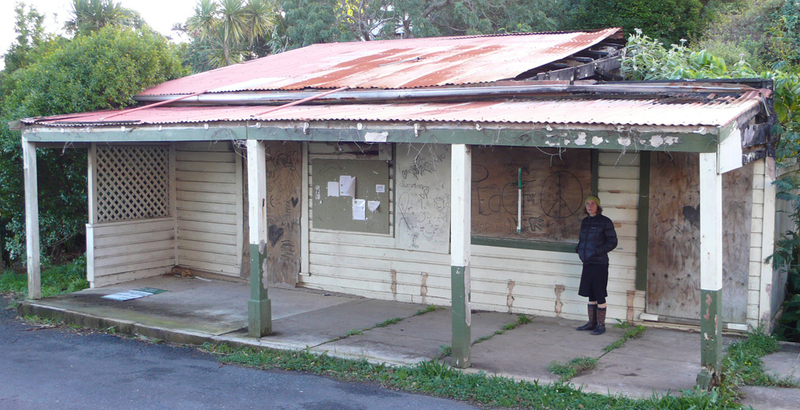 The veranda is all that remains of the well loved store, since the fire in 2002. 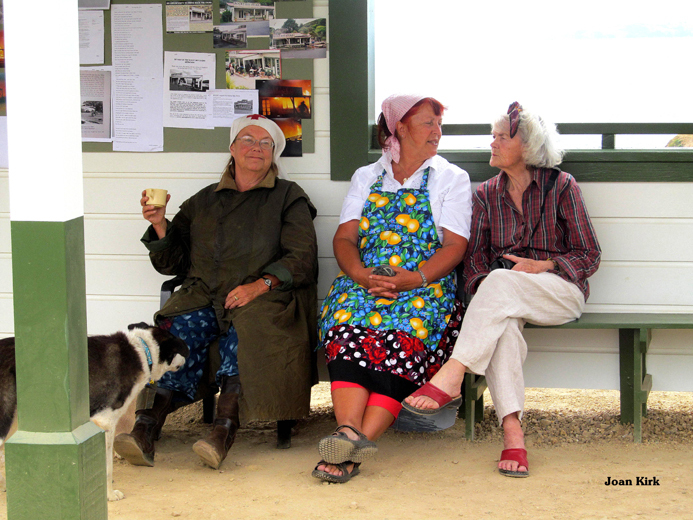 The project was a stage for the community to post images and info on the notice board, and act out roles of well known characters during its former glory. 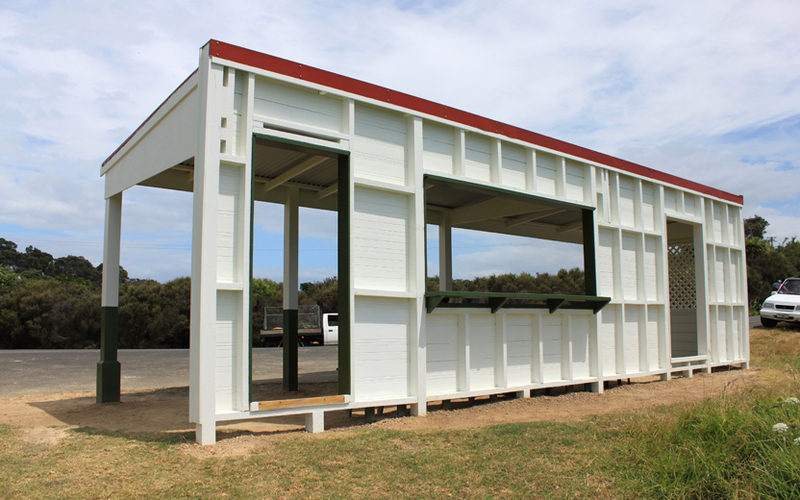 Wood, weatherboard, iron, plywood, paint. Four-week duration. 10 x 3 x 3.5m. 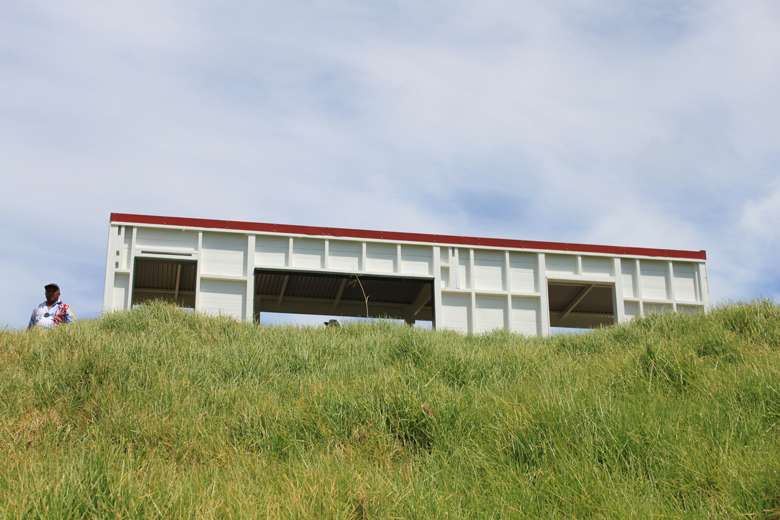 headland - Sculpture on the Gulf 2013. 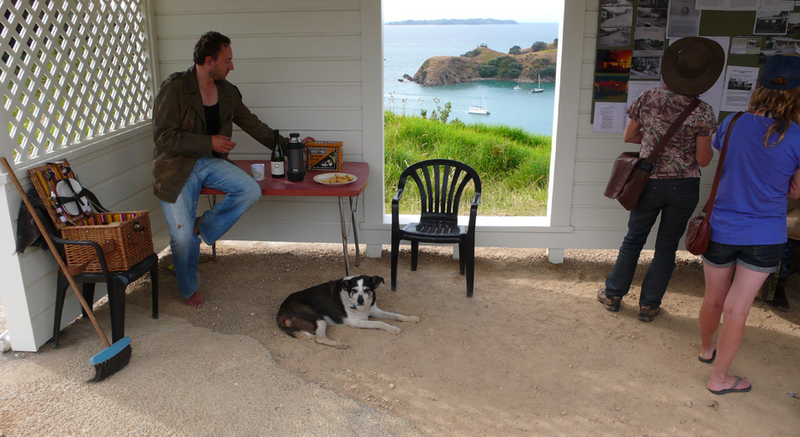 Waiheke Island, New Zealand. This project developed from a brief conversation at a party about small towns and progress. Talks were made with many of the parties involved in the history making event. Although I have never communicated with the current overseas owners. 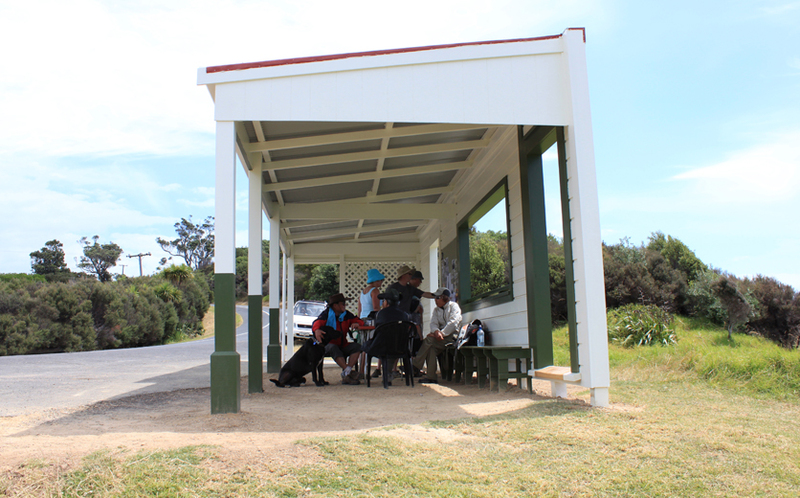 “Death Row” is the local nickname of the porch and bench seats that were out the front of the Rocky Bay Store, Waiheke Island. 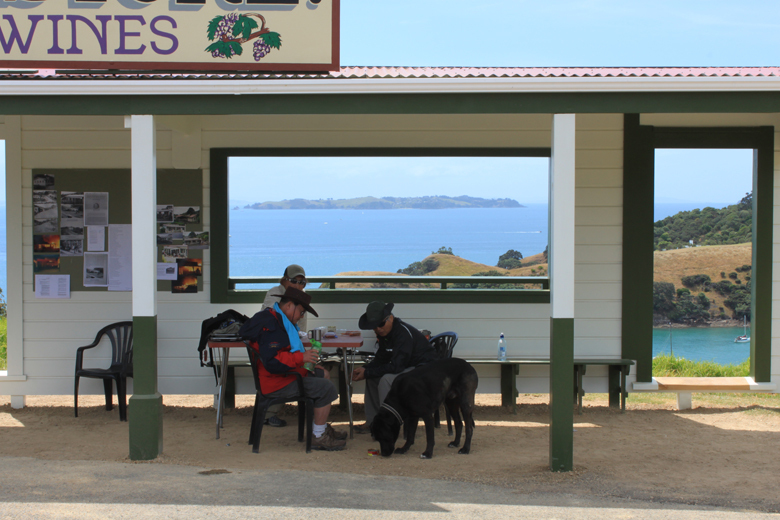 The oldies would sit out there drinking and nattering, and slowly die off… the store stock of locals was replenished when a new old codger or granny joined the crony ranks. 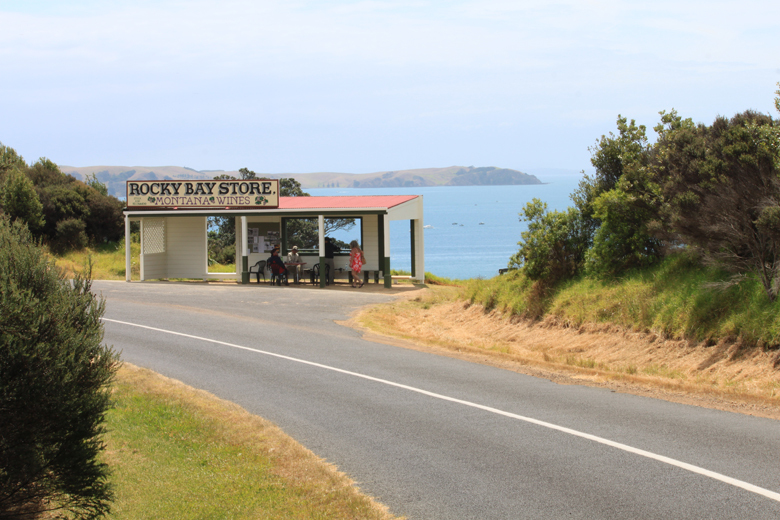 Rocky Bay is a small community on the south side of Waiheke Island. 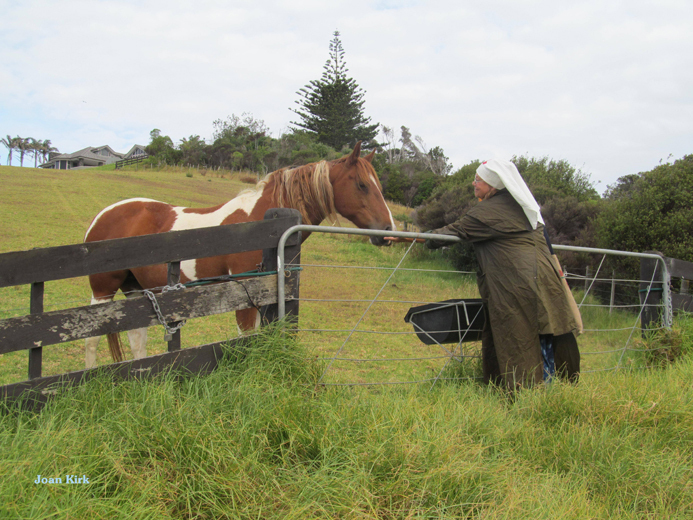 It became the last community to be connected to the island's road network when O'Brien Road was completed in 1956. Then in 1957 it became the first place on the island to be connected to the national electrical grid. This physical isolation galvanized a type of community spirit that is unique and still seems to be alive and thriving in the bay. 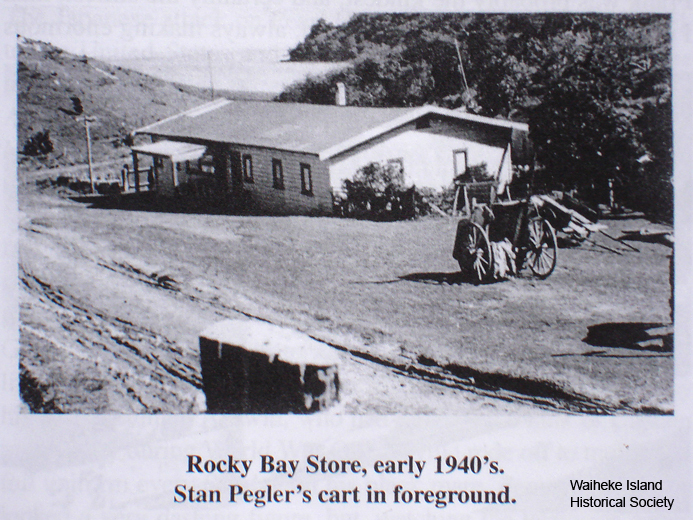 The Rocky Bay Store was built in the 1920s, and operated as a general store, café, and dance hall under a series of commercial owners until 2002. 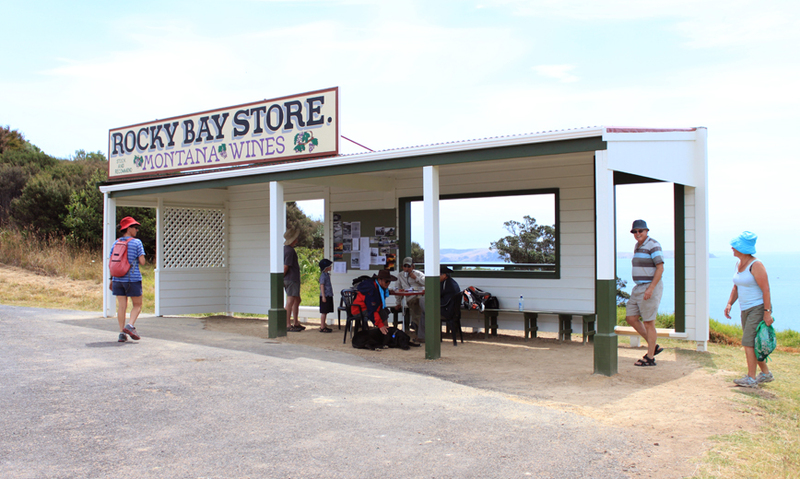 It had become an historic icon and focal point within the community supplying locals and yachties. 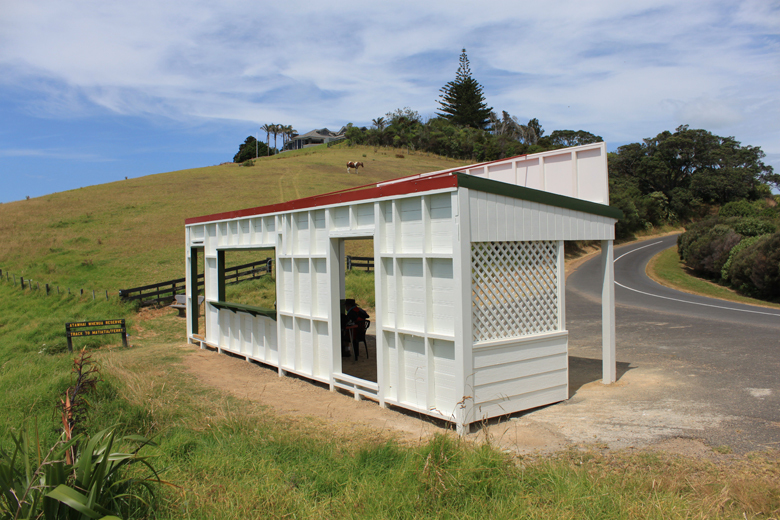 It was one of only two liquor outlets on the island and one of the first in the Auckland region; the porch area is on public land so the shop required no drinking license. 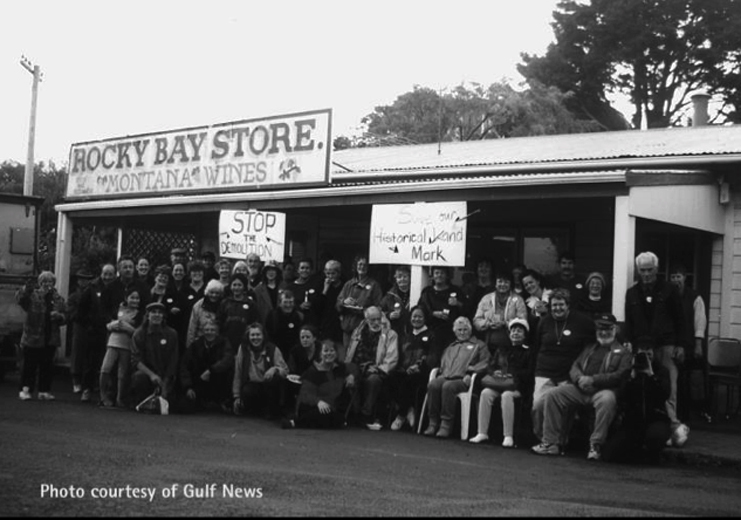 In 2002 the current owners decided the store was no longer in their economic interests to continue operating and they sought to redevelop the site. Having successfully applied for a demolition order to pull it down, the owners hadn't considered the reaction from the community who banded together on demolition day, linking arms and preventing the demolition. 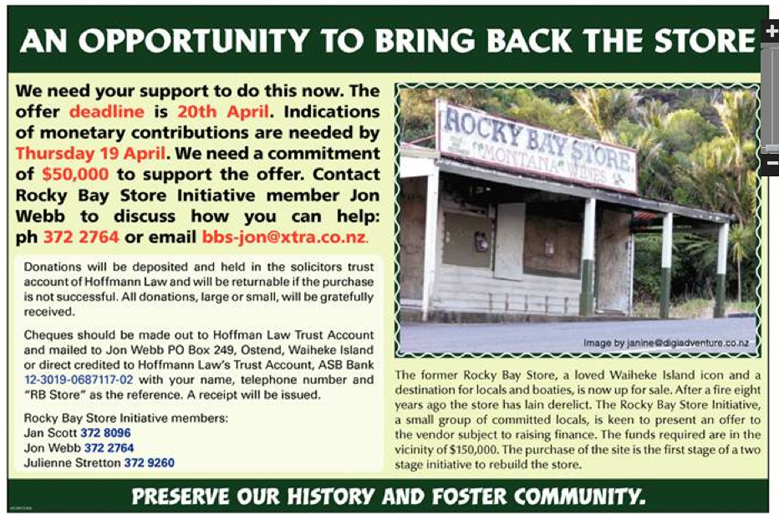 The community then got a stay of execution for the store from the Environment Court and heritage status was granted. 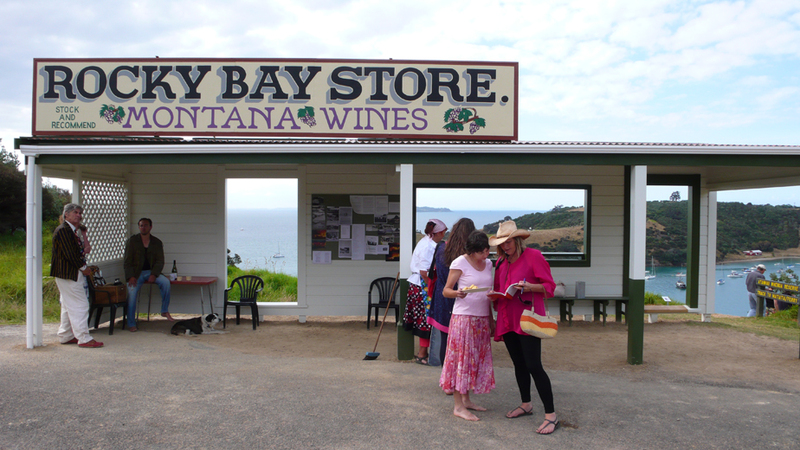 The store was saved until October 2003 when it mysteriously burnt down. For the last 9 years the burnt out remains of the store have stood as a sad reminder to a lost community icon and cause. 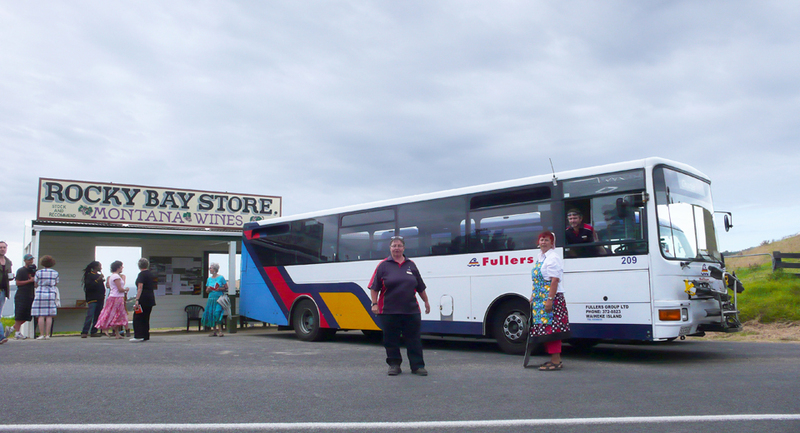 During the Gulf exhibition the store provided many roles: exhibit, information dissemination, bus stop, shelter from the elements, meeting area and a theatre prop for a play written by Janine James about the store, community and its people.